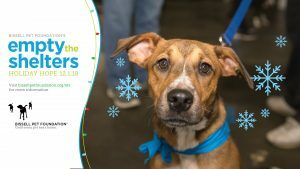 This coming Saturday, December 1st the Bissell Corp will be sponsoring another Empty the Shelters event!! Adoption fees will be $20 per pet with the remainder sponsored by Bissell. Unlike previous events, we WILL be including PUPPIES and KITTENS this time. Please contact the shelter for more details. Filling out your application for pre-approval is HIGHLY RECOMMENDED.